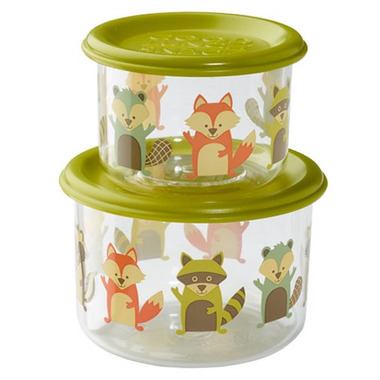 The What Did the Fox Eat?®Good Lunch® Snack Container Set features friendly foxes wondering what's for snack time today. Food stays fresh and tasty in these clear, durable, leak-proof and safe containers. Sized just right for lunches large or small, BPA-free, odour, stain, shatter and scratch-resistant. Light, practical, and stackable for compact storage, Good Lunch® Snack Container Sets come in two convenient sizes to make snack-packing a snap! Perfect for microwaving and freezing food portions, and taking snacks on outings or in school lunches. Use them to prep and store meal ingredients, snacks and more. Size (inches): Small set of two features one medium and one mini. Medium: 3.25 dia. x 2.12 h and holds 1.25 cups or 250 cc. Mini: 2.625 dia. x 1.75 h and holds 0.50 cup or 120 cc.